Finishing top of the group is generally seen as the best result, as top seeded teams will play against a runner-up from another. 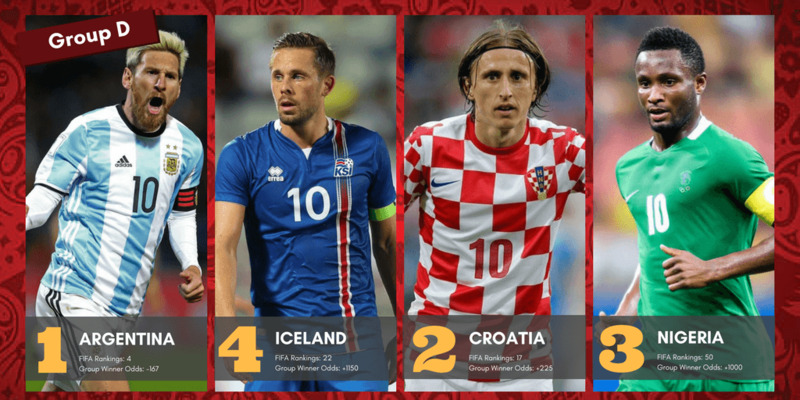 Let's take a look at the World Cup's group stage for 2018 and outline every team’s chances of topping their respective groups. The odds are listed in order from Group A to Group H and will be updated regularly until the final match in each group takes place. Sports Interaction posted group-winner odds in the wake of the draw and a couple of picks presents some great betting value. 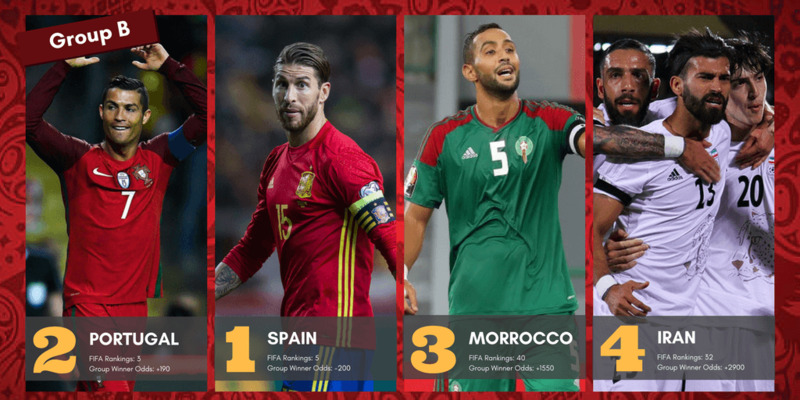 Below you will find our analysis of the odds for each team to top their group at the 2018 FIFA World Cup. The 32 candidates are listed in the order they appear in their group, with both their odds and FIFA world ranking, as well as their predicted final position. It is surprising to see a former World Cup winner and a team featuring the likes of Luis Suarez and Edinson Cavani at +105 to top Group A. Uruguay finished second behind Brazil in the South American qualification group, topping the likes of Argentina, Colombia, Peru and Chile; their current world ranking is definitely not indicative of their ability. We think this is one of the best deals on offer by Sports Interaction and would recommend having a punt. 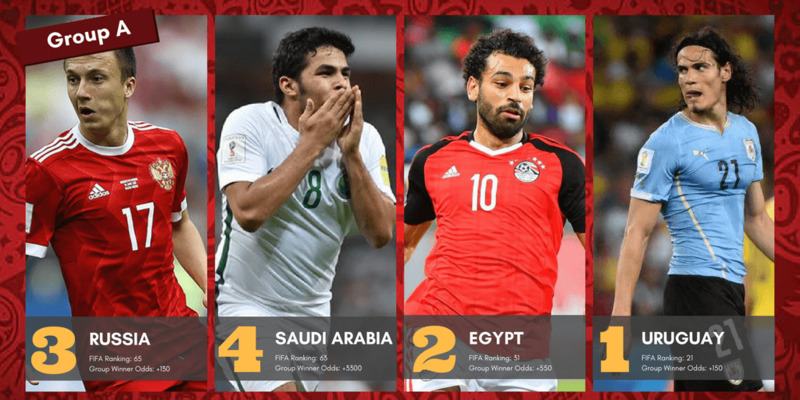 The Egyptians qualified for their first tournament since 1990 and although not a regular at the world's biggest sporting competition we feel as though they have a great chance of progressing through a group that does not contain a team ranked in the top twenty. Plenty will fall on the shoulders of star Premier League forward Mo Salah, but we think they will come out on top against both Russia and Saudi Arabia. The host nation's ranking of 65th is not an accurate reflection of their status in the world game, falling behind due to them not needing to participate in any meaningful qualifying matches over the last two years. They do, however, have a very tricky group to navigate through and the expectation of one of the world's largest nations may be more of a hinderance than a help for the Russians. We expect them to finish above Saudi Arabia, while the key match will be against Egypt as both teams set out to qualify alongside likely winners Uruguay. The relevance of the FIFA rankings is further exemplified here - Saudi Arabia is ranked higher than Russia, yet are priced at over 20 times less likely to top the group. We agree that they have no chance in topping the group and believe they will struggle to take a point from their three games. As mentioned above, it will all come down to the match with Portugal, with both sides expected to beat Morocco and Iran comfortably. It could come down to goal difference if the match finishes level, so the team that can score the most goals against the minnows may come out on top. We think Spain just edges the Portuguese for potential goals, although it's going to be close. The 2016 winners of the European Championships won nine out of ten of their World Cup qualifiers and will certainly be one of the favourites to progress to the second round. The main question will be whether or not they can beat neighbours Spain in their first match - a fixture that should determine the final standings. It's strange to see Morocco so far ahead of Iran in the odds for group winner, considering both their rankings and the fact that neither team has a realistic chance. We do agree that Morocco will finish higher - they showed plenty in their clutch qualification against the Ivory Coast. Iran qualified from the weaker of the two Asian groups and won't do much at this tournament, most likely going 0-3. They have won just one game in twelve attempts at the World Cup. Our predicted group finish - 4th. The French are one of the favourites to win the tournament and should breeze through their group. Australia and Peru have no chance of beating the star-studded team, while Denmark's European experience could at best earn them a point. At -333 they don't offer too much value though, and they have a habit of not turning up to tournaments (their record at the last five tournaments is Winner, Group Stage, Runner Up, Group Stage, Quarter Final). We think they'll buck the trend and sweep the group. The Danes are one of three teams in the group who needed a playoff to secure their spot, and showed their class in their 5-1 demolition of Ireland. Christian Eriksen will lead the way for a team that is still highly underrated - we expect them to progress and are the only chance of winning Group C at France's expense. Australia had perhaps the most arduous qualifying campaign of any side, needing playoffs against Syria and Honduras to make it to the tournament and proving they can perform well under pressure. However, they have lost their coach and simply don't have the quality to beat their European rivals. 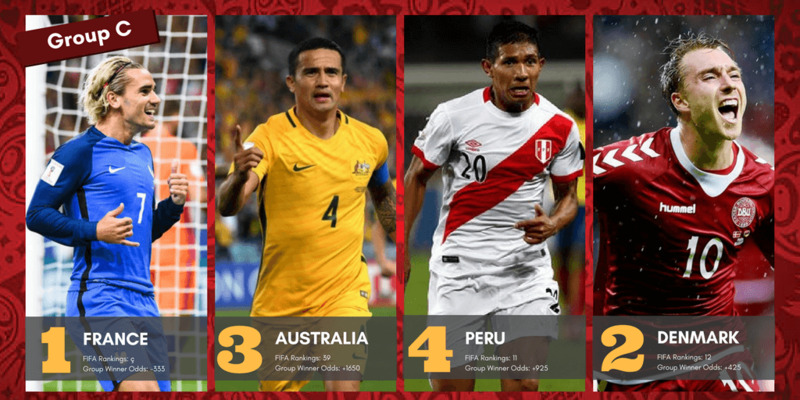 The last match should decide the group and the Aussies will scrape a win against Peru. Peru struggled to see off New Zealand in their playoff match, and like Australia are not likely to beat Denmark or France. Their ranking is definitely inflated, and they will be missing one of their best players through a drug ban. The two-time winners of the World Cup have topped their group in the last three tournaments. While the Argentines made it hard for themselves in qualifying, Lionel Messi led the side to a final-day World Cup berth and you would have to think that the 2014 runners-up have another chance to win it in 2018. They are good value at -167 and a recommended bet. Croatia blew Greece away to secure their place at the tournament, and players like Real Madrid's Luka Modric should have enough quality to see Croatia through. We can't see them winning the group, in spite of their reasonably good odds. Poor Nigeria will be wondering what they have to do to avoid Argentina in the group stages. Incredibly, the Nigerians have come up against the South Americans in four of their five World Cup appearances, and the presence of Lionel Messi and co. gives them no chance of winning Group D. We think they will be too strong for Iceland, and are an outside chance of finishing above Croatia. Iceland have been a revelation in world football since their incredible run at the 2016 Euros, and qualification for their first World Cup came at the expense of Turkey and the Ukraine. They also finished above Croatia in qualifying, and will go into the tournament with plenty of confidence knowing they can beat at least one side in the group. Can the run continue? We really want to believe it but can't see it happening. Arguably the biggest footballing nation on the planet, Brazil have won five World Cups and dominated the South American qualifiers. They won't have it all their own way in Group E against some competitive teams, although they shouldn't have too many problems in topping the group - the biggest concern is whether you see -333 as a worthwhile investment. The Swiss had a fantastic qualifying campaign that featured nine wins and just one loss against Cristiano Ronaldo's Portugal. They made hard work of their match against Northern Ireland, however they will come into their first match against Brazil knowing that if they can avoid defeat they will have a great chance of qualifying. 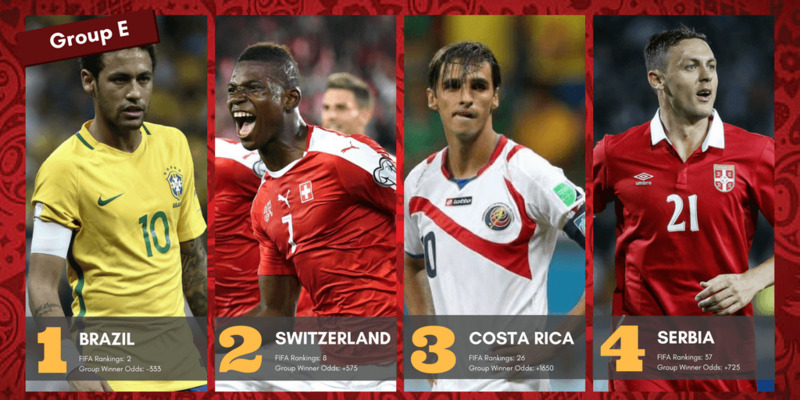 Whoever set the odds for Costa Rica must not have watched the 2014 World Cup; the Central American nation topped a group consisting of Uruguay, Italy and England. They should not be underestimated, and we think that while lightning won't strike twice, they will win their opening match against Serbia. Serbia avoided the big names in their World Cup qualification campaign, and managed to top their group, although there's nowhere to hide in the final 32 and we don't expect they will do too much in Russia. They will have the advantage of playing against Costa Rica in the first match instead of the top two teams, although as mentioned above we feel Costa Rica may have the edge. The top ranked side and defending champions shouldn't have too many problems finishing at the summit of Group F. The Germans were ruthless in qualifying, winning all ten matches, scoring 43 goals and conceding just four. They have talented players all over the park and will be tough to beat; at odds of -286 they present slightly more favourable odds than France or Brazil and are a worthwhile wager. Mexico were too good in the CONCACAF qualifiers and will be confident of making it through the group. The side has made it to the round of sixteen in the last six consecutive World Cups, a feat shared by only a handful of nations. They will certainly give Germany a good match, while their game against Sweden is likely to determine their progress. It's a tight call but we believe they can continue the trend and make it out of the group (although they will likely be rewarded with a match against Brazil). You can blame Sweden for the fact that both the Netherlands and Italy are no-shows at the 2018 World Cup; the Netherlands finished below them and France in their European group, while Italy of course failed to score in their playoff and are staying home for the tournament for the first time in 60 years. 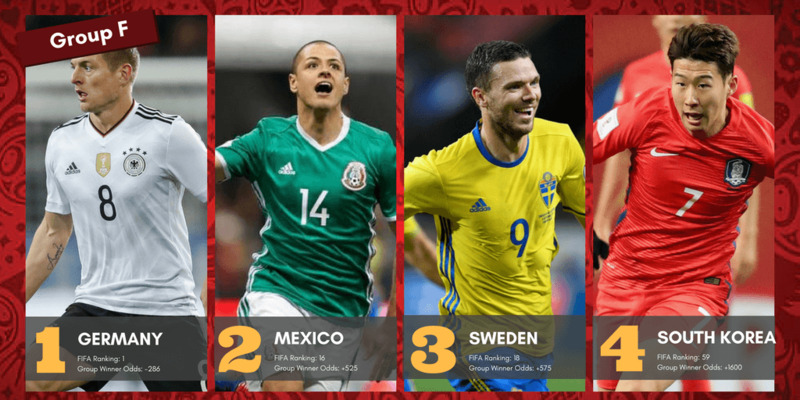 Sweden and Mexico are the obvious candidates to challenge Germany in this group, and you can make a case for both sides. One may argue that the quality of Sweden's opposition throughout qualifying was better than Mexico's, meaning they are more likely to overcome tough opponents, although we believe in a matchup between the two teams the Mexicans will win. There's not too much to be said about the South Koreans, who shocked the world by making it to the semi-finals as hosts of the 2002 tournament. We can't see them gaining a point in this group. The Belgians were another team that excelled during qualifying, finishing with a run that almost exactly mirrored that of the Germans. They currently boast one of the most feared lineups on the planet, including Kevin De Bruyne, Eden Hazard and Dries Mertens in the attacking third. Their clash against England will be one of the most anticipated of the tournament, with both teams featuring a vast majority of English Premier League players. 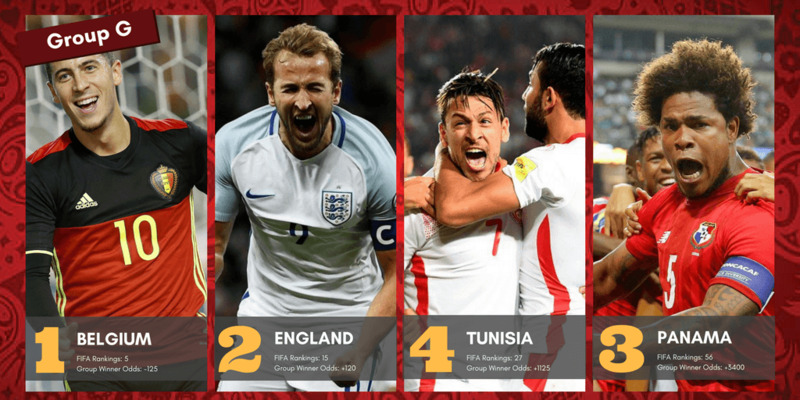 With lowly Tunisia and Panama set to make up the numbers in Group G, the match against England will likely determine the group. Ah England, a team that always has so much promise yet rarely lives up to expectation. Unlike in 2014 where they drew the likes of Italy and Uruguay (losing both pool matches), they have been presented with a great opportunity here, knowing that the teams that progress will face teams from Group H.
They could top their World Cup group for the first time since 2006 if they can beat Belgium, but we're not so sure that they will. The safe bet here is a runner-up finish. First-timers Panama benefited from the USA's capitulation on the final day of qualification, and will look to carry momentum into their first match against Belgium. The likelihood of their progress is staggeringly low, as indicated by their odds, but we think they can overcome Tunisia. Tunisia are not expected to make too much of an impact in what will be their fifth World Cup appearance. In twelve previous attempts the African nation has managed just one victory, way back in 1978, and have never made it out of their group. Their game against Panama will provide them with an opportunity to make it two wins, but we're sure they won't qualify. Although this group is reasonably competitive, we think the odds are very generous for Columbia here and expect them to win all three matches. The South Americans topped a similar group in the 2014 tournament, which featured Greece, Ivory Coast and Japan who finished in that order. Columbia are paying extremely generous odds here, and we are confident they will top the group with relative ease, meaning this is another good opportunity for a wager. It's hard to believe that this is just the second time Senegal have qualified for the World Cup. No one will ever forget their 1-0 win over reigning champions France in the 2002 tournament where they finished seventh overall. They have been placed in a group where they a definitely a chance; we are going to back them to be too strong for Japan and get a result against Poland to sneak into the second round. This is perhaps the most open group at the World Cup, and although Poland are the top seed they will enter the tournament as second-favourites to top their group. It's easy to see why. 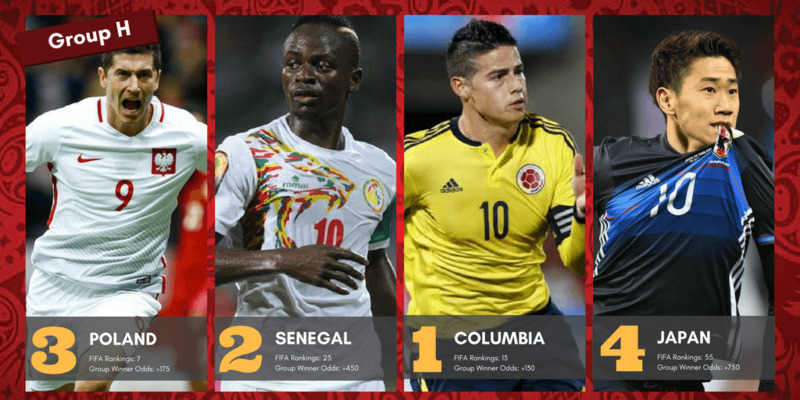 Columbia will provide a stern test, Senegal is one of the better African qualifiers, while Japan is definitely the best from Asia. This truly global group will go down to the final round of fixtures. Poland did not qualify for the last two world cups, and have not made it out of their group since 1986. While their squad is noticeably better these days, their FIFA ranking is noticeably inflated. We are going to make a big call here and predict that they will make a shock group-stage exit. Japan's ranking of 55th simply makes no sense. They appeared in the stronger of the two AFC qualifying groups and finished at the summit, yet are ranked behind Australia and Saudi Arabia who shared the pool. Regardless, we don't expect them to make it out of this group.